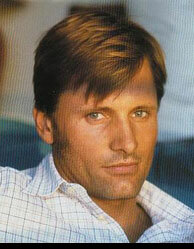 Biography: Since his screen debut as a young Amish Farmer in Peter Weir's Witness (1985), Viggo Mortensen's career has been marked by a steady string of well-rounded performances. Critics have continually recognized his work in over thirty movies, including such diverse projects as Jane Campion's The Portrait of a Lady (1996), Sean Penn's Indian Runner, The (1991), Brian De Palma's Carlito's Way (1993), Ridley Scott's G.I. Jane (1997), Tony Scott's Crimson Tide (1995), Andrew Davis' A Perfect Murder (1998), Ray Loriga's La Pistola de mi hermano,(1997), and Tony Goldwyn's A Walk on the Moon (1999). Born in New York to a Danish father and an American mother, Mortensen spent the early part of his childhood in Manhattan. His family traveled a great deal and he spent several years living in Venezuela, Argentina, and Denmark. He began acting in New York, studying with Warren Robertson. He appeared in several plays and movies, and eventually moved to Los Angeles, where his performance in Bent at the Coast Playhouse earned him a Drama-logue Critic's Award. Mortensen is also an accomplished poet, photographer, and painter.